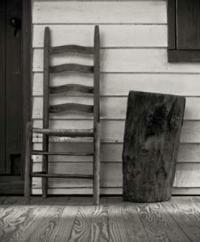 Ladderback chairs had backs that resembled ladder rungs. The 18th century ladderback chair was one of the most popular chairs of its time. It was easy to construct, simple in design and affordable to make. Today, these classic chairs are desirable pieces for antique collectors. A ladderback chair, also known as a slat-back chair, is named for the horizontal slats across the back of the chair, resembling the rungs of a ladder. The slats, usually two to six in number, are connected to the straight back posts with a mortise and tenon joint. The posts of the chair are perpendicular to each other and were usually turned, or rounded, on a lathe. The classic version features a high back and a woven rush seat. Most ladderbacks of the 18th century had arms, although armless chairs were common. Some are rockers, some are not; rockers were sometimes added later. Ladderbacks from the 18th century were made of hardwood. The English ladderback was made of ash, beech or oak; American ones were made of maple, oak or other hardwood. The most popular finishes were stain or paint, usually in red or black. The ladderback is believed to originate in the Middle Ages in Europe. Its popularity rose dramatically after the Protestant Reformation, as the chairs were plain in style, a trait valued by early Protestants. The chair came across the Atlantic with the early American colonists. Furniture makers in Philadelphia, Boston and other colony centers made it and sold to all classes of colonists. Rural farmers also embraced the chair; it was quick and easy to make. It served as a dining chair, a "sitting" chair and a pew chair. Quakers used it as the chair for their meeting houses. During the second half of the 19th century the advent of the Victorian style of furniture diminished the popularity of the simple ladderback. Once prominent in parlors and front porches, it was demoted to kitchens, second bedrooms, or even attics. Ladderback chairs still hold a place in modern furniture design. Reproductions of the 18th and 19th century chairs are in most furniture stores. Original versions are still found in antique stores and auctions. The condition of the chair is important in determining its value. Ladderbacks were used in everyday life; therefore, they are not expected to be in mint, or "brand new" condition. To be considered in excellent condition, no pieces should be missing; it should be strong with no cracks, severe scratches or blemishes. The closer the ladderback chair is to its original state, the more valuable it is. Refinishing or reupholstering depreciates the value. Likewise, if the legs, arms, posts, slats or seat have been replaced the value is diminished. Provenance is the custodial history of the antique. A verified provenance can greatly enhance value. As with all antiques, the quality of the craftsmanship determines a great deal of the value. Since experts and amateurs made these chairs alike, the quality of the piece is even more important to the value. Ladderbacks are a common chair. Unusual designs or ornamentation, as long as they are original to the chair, make the chair more desirable to a collector. Simple, common sense care can help retain the chair's value. Do not refinish or repaint. Have any repairs done by a professional conservator. Keep it out of extreme temperatures, humidity and sunlight. Dust frequently with a soft cloth. Have a conservator evaluate the finish to determine if the ladderback would benefit from waxing or cleaning. Never use commercial cleaning products that contain silicone. Antique ladderbacks are a graceful addition to almost any decor. With proper care, they have proven they can last hundreds of years and retain their beauty and functionality.